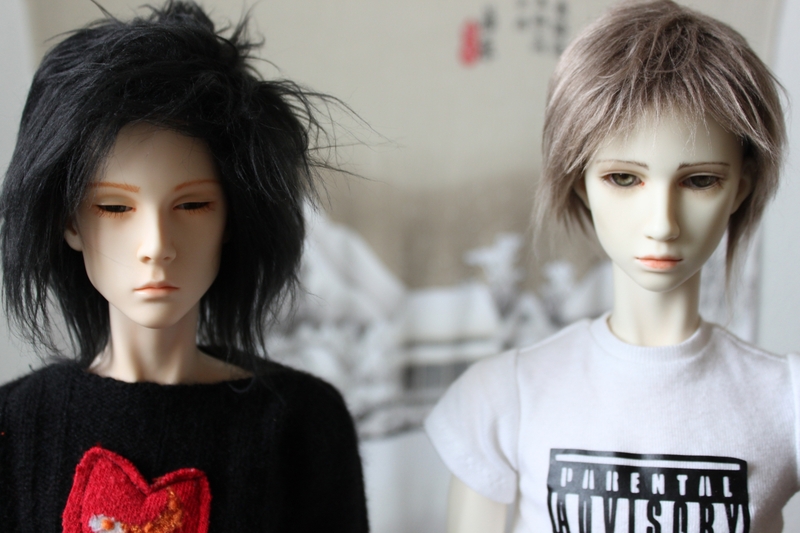 Here is Brick Facade (Dollshe old SA Saint) and his original face-up, along with Ethan (Dollshe Pure Body Bernard). Truthfully, I felt Brick was too pale but, well with my hand issues and getting all sidetracked with photography and drawing, I didn’t think about it again until yesterday. I wanted Brick to be one of the boys in my Tatami Room photo shoot. However, when I took his head out of his storage box, one of his eye lashes had partially peeled off and his eyes were rolling around in his head. The poor boy needed some work. This is my first face-up since taking my drawing and painting classes. Would my new painting skills improve my face-ups? That is a question I wanted to answer. Here is Brick cleaned up – yes, there is some residual color. It’s really tough to get into the corners of the eyes and the lip crease. The day was good for a new face-up it is a clear, sunny, if cold November day. In terms of humidity, a good day for a face-up. What style face-up should Brick have? The Bernard and Saint are sculptural brothers, so I set out today to remake Brick to look like Tennyson’s brother. I love Tenny’s coloring, although the gloss stage of his face-up was a bit heavy-handed and his lower lashes are a bit heavy. These are obvious in real life, but this doesn’t show up as much in photos, where he just looks gorgeous. I didn’t think to shoot them side-by-side before starting, so here the lads are, after laying down Brick’s first three layers. The main difference between Tenny and Brick 2 is I used acrylics on Tenny. It gives him a more dramatic look, which works for his character and sets him apart from Ethan. For Brick, however, I wanted a natural look in a color range that makes them look like brothers. For Brick 2.0, I used Rembrandt and Volks pastels, Prisma pencils, and Tamiya gloss. I start with shadows and work toward highlights, sealing between layers. My shadows, mid-tone and highlights were variations of brown. Chosen because Brick 2 is Oriental skin, so I have to work a bit darker than I did with Tennyson’s Fresh skin, which is nearly white. Once the brown layers were done, I added the peachy/rosey layer, which is when he really came to life. Here are Brick and Tennyson after the final sealing and gloss layer. I really like the way Brick turned out and will be patient and wait until at least tomorrow for the gloss layer to cure before I put him back together and shoot more photos.